These little mason jars will be a hit at any party, get together or wedding. Cool classic retro jar shape everyone loves. Use for drinks, shots, party favors, crafts, condiments, candles or whatever you can dream up.Keep your jams, jellies, sauces, mustard, flavored vinegar, and more fresher longer! This set of 25 Wide Mouth Jars have an 4 ounce capacity and are constructed of durable glass. SATISFACTION GUARANTEE:The VERONES Better Guarantee,If you experience an issue with your VERONES product, get in touch with us to repair or replace it. We¡¯re grateful for the opportunity to learn from your experience,and we¡¯ll make it better. 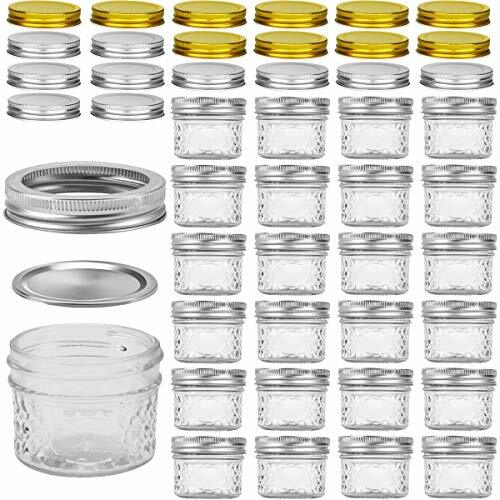 SET INCLUDE: Case of 25 Glass Jars with 25 Silver Lids, Free 10 Golden Lids, 10 Silver Lids and 30 Chalkboard Labels.This jelly jar set is of the highest quality and designed for your convenience. FOOD GRADE:Each mason jar is made from food grade materials.Great for food storage. HIGH QUALITY & FREE CHALKBOARD LABELS:Thick 4oz VERONES glass jars with food-safe, corrosion resistant lids - material is certified safety standards.In the meantime,we are also considerate enough to send you 30pcs chalkboard labels. No worries about same -faces food like milk powder and flour.We also add 10 golden and 10 silver lids for you to spare. VERSATILE:These vintage style, attractive, quilted jelly jars are ideal for shower gifts.Make a Thoughtful Gift - Fill With Preserves, Spices, Jams, cookies, candles or Honey - Decorate With String, Ribbons, Bows, or Twine to Create One-of-a-Kind Wedding Favors. DURABLE:Refrigerate up to 3 weeks, freeze up to 1 year, fresh preserve and store up to 1 year. If you have any questions about this product by VERONES, contact us by completing and submitting the form below. If you are looking for a specif part number, please include it with your message.